Four Americans died on Wednesday, January 16, 2019 in Manbji, Syria while on an engagement patrol. A suicide bomber detonated his explosive vest killing two U.S. servicemembers, one DoD civilian, and DoD contractor. Three other U.S. servicemembers were wounded. Approximately nine Syrians were also killed and others wounded. The Islamic State of Syria has claimed responsibility for the attack. ISIS controlled Manbij until it was forced out in 2016. Despite the proclamations of some Trump administration officials the Islamic State is far from defeated in Syria. The terrorist group has now shifted tactics and resumed its insurgent activities. It will continue to have a deep reach in Syria for some time. A Sikorsky S-92 helicopter conducted the medical evacuation of the U.S. victims of the attack. The attack took place near the popular Palace of Princes restaurant. 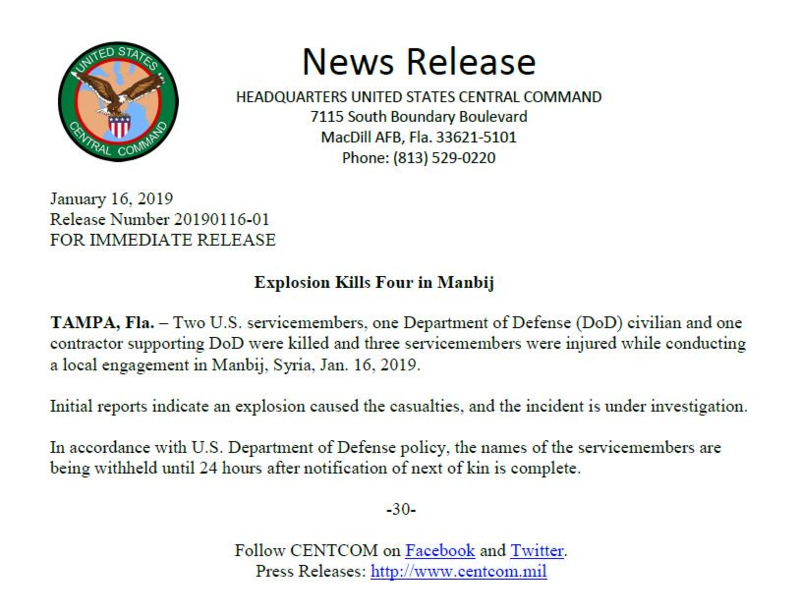 “Explosion Kills Four in Manbij”, CENTCOM, January 16, 2019.